The world looks different as a Doctor of Physical Therapy. We are the movement professionals and the ability to pick out movement impairment syndromes is what makes us unique. Watching an individual walk by is a orchestral work of motion, each instrument (muscle, joint, nerve, etc) contributing to the amazing picture that allows the body to get from point A to point B. The ability to change that, improve that, identify issues, etc is the closest I've felt to being magic. And yes, I believe my Hogwarts letter was disguised as my acceptance letter to DPT school. With this unique ability comes the potential to identify problematic, inefficient, dangerous or great movement patterns. Elite athletes are elite for many reasons. One of the many is that they move differently. They have mastered movement patterns and have amazing efficiency through the air, water or whatever medium. The rest of us who attempt these sports... we look different. We have movement patterns that make us less efficient, waste more energy/power, etc.... which slows us down. 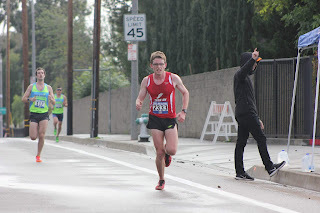 So using myself as an example from my recent foray into the Brea 8k last weekend (10th place, 26:03), let's look at a common movement pattern that tends to slow runners down. These photos are from around mile 4 to 4.5 (of 4.9). 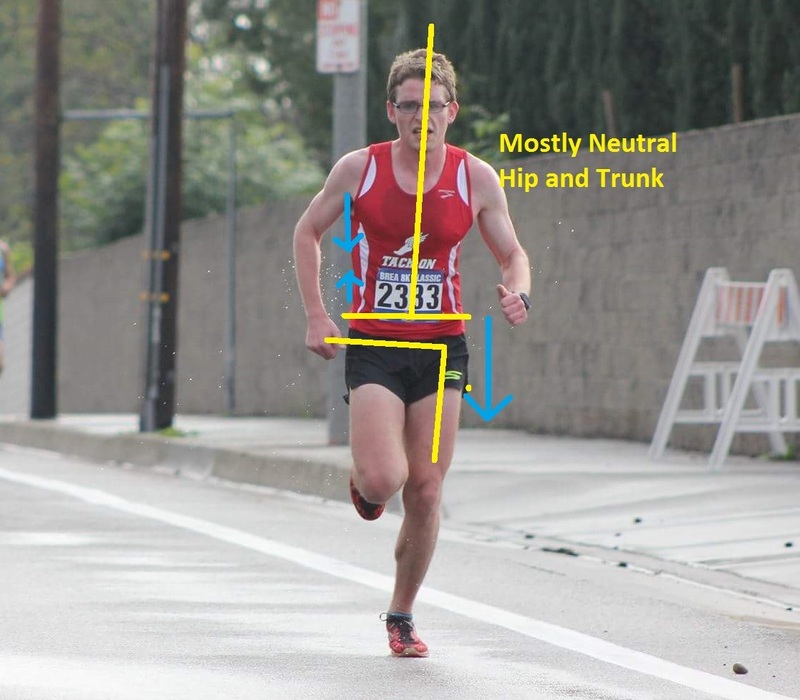 When I evaluate runners, the two areas I start looking at are hip and trunk position. You can see the photo on the left, everything looks fairly straight. The trunk is upright and the hip is not dropping. The photo on the right... everything is falling apart. You can see how much rotation and movement in the frontal plane (side to side) there is landing on the right side. The hip drops, the trunk rotates and leans, the arms are especially swinging. Let's take a deeper look at that right sided landing. The gluteus medius is one of your more important hip abductors and is very important for hip stability. This muscle is located on the side of your hip and is responsible for bringing your femur away from your body (aka abduction) A classic sign of hip abductor weakness is something called Trendelenburg gait. This is characterized by the opposite hip to the stance leg dropping with each step. This can be due to the hip abductors being unable to keep the hip from falling into adduction (which is what hip drop is to a degree) and thus the opposite drops. As the hip collapses, the trunk will lean outside a neutral position, moving the center gravity away from midline. This throws the bodies balance point off and can lead to falls (common in neurologic or some elderly populations). Compensated Trendelenburg gait involves trunk lean towards the weak side in an effort to move the center of gravity back to midline. This is the body's way of compensating and trying to keep everything as aligned as it can despite the weaknesses. That being said, it is never about one muscle. The hip can be kept up by the hip abductors as well as the contralateral (opposite) lateral trunk muscles, namely the obliques and quadratus lumborum (QL). For those that overuse their back muscles, the QL is a common source of pain and tightness due to the muscle being set up well to keep the hip level in the presence of hip abductor and oblique weakness. And given how common hip abductor weakness is, are any of you clinicians out there surprised as to why this muscle gets so tight? (I'm not). You have to address all the synergists (muscles that work together) and make sure everyone is doing their job. Shirley Sahrmann, a fantastic and pioneering physical therapist, is noted to have said that when looking at an injury, look for a weak synergist to the overused muscle before you look at the antagonist. In this (my) case, the rotation and compensated trunk lean seen on the right side makes me think it is worth looking at the lateral trunk stabilizers as well as the hip abductors. Things get a little more complicated due to human variability. You may notice that while the problematic side has a lateral trunk lean to the weak side, there seems to be a great deal of trunk rotation as well. That can come from the gluteus maximus, which does have a large part to play in rotational control of the landing phase of running. Since the greatest amount of shock absorption happens during landing/loading response, the body has to figure out what to do with all that force coming in. If the hip muscles cannot eccentrically load and absorb that force, it has to go somewhere. My right gluteus weakness, due to weakness, may be unable to control the rotation at the hip and the trunk. Thus the excessive trunk rotation occurs as either an attempt to find a further way to load and control that force or due to a lack of hip control (as well as the excessive rotation in the shoulders and arms, which we will discuss in another post). The gluteus medius and lateral trunk stabilizers working decently on this side. There is still a slight trunk lean. 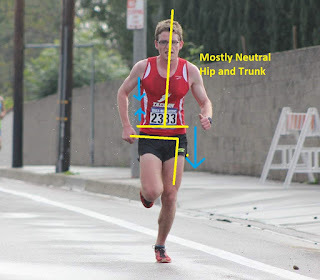 If the trunk and gluteal muscles were strong enough, they would be able to maintain a neural hip position while eccentrically loading the incoming forces during landing, creating a stable base to turn the energy absorbed from impact into propulsion during terminal stance/toe-off (aka the propulsive phase of running gait). A (mostly) good example of this is on my left side in the photo above. Everything is aligned and ready to push me forward as I transition into the propulsive phase of running. On the other side the joints and muscles are not in a good position to generate force because they have collapsed into end ranges due to trying their best to load those impact forces. As one of my professors used to say, "You can't fire a cannon from a canoe." Meaning that you cannot expect to create a high level of force from an unstable surface. If you spend too much energy trying to absorb force due to weakness, it doesn't leave you with much left to generate force to get you forward fast. 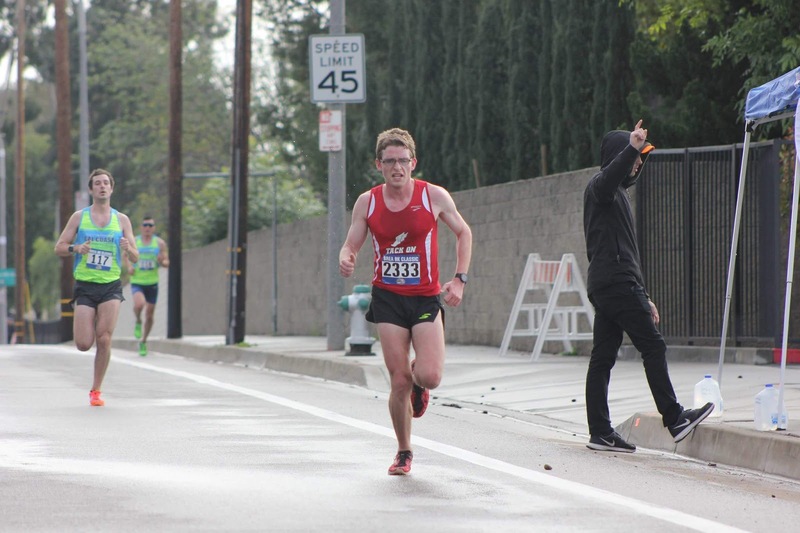 So this may be one of the reasons why the two runners behind me passed me in the last half mile of the race. I was wasting a great deal of energy despite working just as hard as when I passed them earlier. That ends up as a loss of speed and thus a slower time. This is just an example of ONE direction my brain goes seeing those photos (and knowing my body to a certain degree). As many good clinicians will tell you, the answer to what may be wrong is almost always "It depends." I need to emphasize that none of these things can be confirmed until a thorough examination is performed looking at strength, mobility, endurance, stability and the actual movement in motion. Pictures only provide a snapshot into a movement. To truly see motion, you need to see it in action. So the above could easily be a compensation from elsewhere. That being said, having seen this frequently enough, if the above person was a patient (which I am my own patient to a degree), hip strength on the right and trunk strength on the leftwould be the first place I would go. 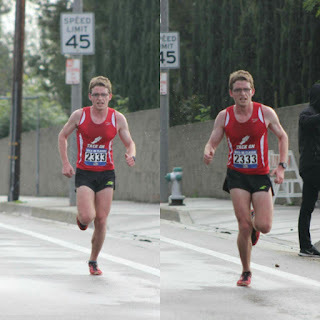 For me, I would need to see more snapshots of my running gait at different points of the race. If this goes on through the whole race, it could be a strength and endurance issue. If it starts toward the end, muscular endurance may be the issue. Or this could just be a learned movement that I need to unlearn. There are many potential reasons why this is happening. Conslusion: hip drop and at times compensated trunk lean are common sources of inefficiency and power loss. They can signify hip abductor and lateral trunk weakness that may need to be addressed. 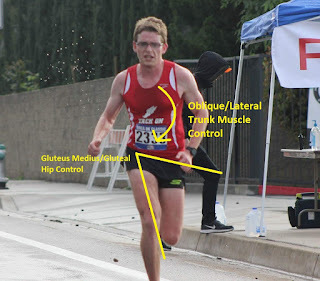 If the hips and trunk are not stable, do not expect to be able to generate a great deal of force from the hips, which normally can generate incredibly high amounts that help push those elite runners forward so fast. For those looking for solutions, a few favorite exercises for these issues can be found in my Hip Abductors and Hip Stability Post, which I encourage you to read for more information. Thanks for reading and joining me on my journey as an evolving Doctor of Physical Therapy. I'll address this issue and analyze more deficits in the future from myself and others. Strengthen your body appropriately as always.